BMC-2.12,61; Jameson-509 (same obverse die); Grose-pl.65#13 (same obverse die); Pozzi-pl.XII#38 (same obverse die); SNG ANS-unlisted; SNG Cop-unlisted.EXTREMELY RARE. 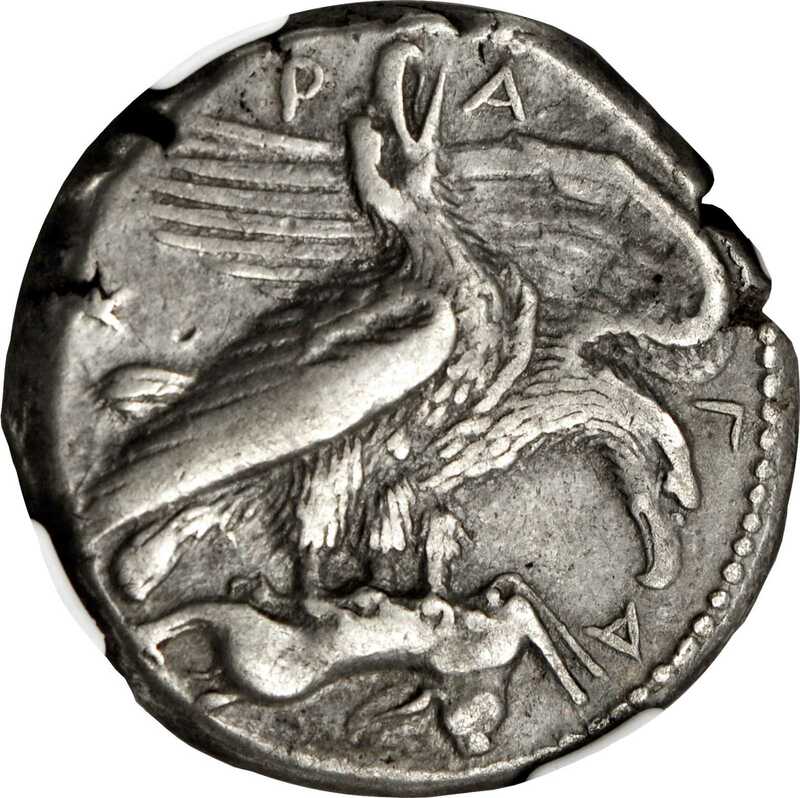 Two eagles standing right eating supine hare; Reverse: Crab, Scylla (with two hound protrusions) below swimming left . An extremely rare die pairing of an already very rare coin. Reportedly only about a dozen examples of this type are known, nearly all of which seem to be struck from the same obverse and reverse die pairing. While the example offered here shares the same obverse, it uses a slightly different reverse. The most distinct difference being deviations in the placement of the legend. Well centered with good metal quality, lightly toned and quite attractive.，NGC Ch VF, Strike: 5/5 Surface: 4/5. Fine Style...Ex: Stacks Bowers & Ponterio Sale 01/2012, Lot #72 where it hammered at $22,500.